Monarchs have been in the news a lot lately. No, I am not talking about the British Royals here; I am referring to possibly the most recognizable butterfly found in North America. The Monarch Butterfly with its distinct orange, black and white markings are highly noticeable and just as recognizable. However, one other aspect of the Monarch Butterfly has been highly noticeable and is concerning. This is the very alarming and rapid decline in the number of Monarch Butterflies overwintering in Mexico over the past 10 years. Monarch Butterflies are amazing creatures migrating up to 3000 miles. 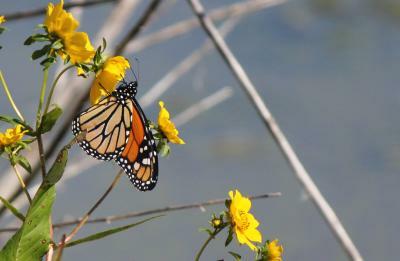 Monarchs migrate from as far north as Minnesota all the way down to Mexico. What is particularly unique of the Monarch migration is that the individuals that overwintered in Mexico are not the individuals who return the following year. They are separated by four generation. That would be like you instinctively knowing how to get to your great-great-grandfather's childhood home. Monarch Butterflies have seen significant decline in recent years and this is alarming. In the past three years, an estimated average of 50 million individuals was seen in Mexico. Now to many this may seem like a lot of butterflies, and on the surface it is, but the long term average is 300 million individuals. That is nearly an 85% reduction in estimated population. Much of the reduction in these numbers is attributed to loss of habitat. Loss of habitat means that there is a significant reduction of food. The caterpillar feeds almost exclusively on plants in the Milkweed family (Genus Asclepias). This means that if there is not enough food to go around for the caterpillars, then there will not be as many adults. In addition to the threat to milkweed, there is also a lack of nectar plants for the adult butterflies. Adults, though they do not grow, need a food source to keep them going. Milkweed already has one strike against it. It has the word weed right there in its name. Despite this, milkweed is a beautiful plant that can add some interest to your garden. Milkweed does not only provide a food source for Monarchs, it is also an important source of food for other pollinators including native bees. Milkweed is considered a perennial and will come back the next year from both the root stock and the seed that was produced the previous year. Milkweed comes in a range of colors including white, pink and purple. Different species of milkweed prefer different conditions, but in general they like full sun. Nectar sources are also important as a food source for adult Monarchs. These plants provide the energy that is needed by the butterflies to reproduce and contribute to the next generation. The nectar plants are particularly important for the fourth generation, as they need enough energy to migrate to the wintering grounds. So as you plan your flower beds for next spring, be sure to provide a home for some Monarchs and other pollinators as well. Save some space for milkweed and nectar plants. For more information on planting milkweed or attracting butterflies, please contact Jason Haupt (jdhaupt@illinois.edu).